Here, in a wintery and very sleepy Ascona (where are all the PEOPLE? ), we indulged in an early afternoon coffee/aperitivo with Frau Mama and the children. Mr R and I, with critical London-type-eyes, often delight in the subtle and surprisingly numerous style 'normalities' that this magical living spot offers. 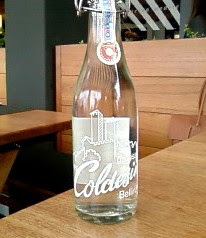 Here is a perfect example: a bottle of lemonade, from a local drinks company. Not posh, not fancy, just lemonade. I must apologise for the poor quality of the photograph, but I do hope that it captures nonetheless, the simplicity of a wonderful design. This deserves writing about....classic stuff!